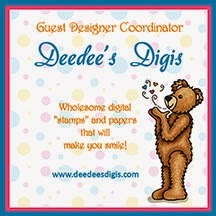 What a way to start as a new Design Team Member....Yes, I'm honored to be part of Deedee's Digis Design Team!! And to begin my new adventure I'm blessed to be part of Deedee's Digis One-Stop Hop!! There's lots of great things to find along the way....You could find a new friend, some crafty inspiration, a freebie, and even a chance to win more digis!!! What more can you ask for? It's a great time for a blog hop too because winter has settled in and we are all spending more time in our craft rooms. Now you can be inspired and who knows what you'll wind up creating next time you sit down at your craft table. When you visit each of our designer's blogs and leave some love (we all love reading comments don't we? ), you'll be entered to win a digi set at EACH STOP! WOW! And there's more!!! Join our sister team at Daydream Designs blog for more inspiration, more prize drawings...and more FREEBIES! The fun starts today at Deedee's Digis blog and you have until Sunday, January 19th, 6pm CST to participate. Remember that you could win this set (or any other set of your choice) from Deedee's Digis just by leaving me some love...or even just saying hello. Don't forget that one will will be selected by random drawing when our hop closes on January 19th (Sunday evening). Be sure to come back to Deedee's Digis blog after 7pm CST on January 19th to see if you've won!!!! What a beautiful Scripture, one of my favourites. You made a lovely card, Zella. Love the images! The world in a heart, - just fantastic. You did a wonderful job with this set. Enjoy your day. Look at you, coloring like a pro and crafting like a champ!! What a fun image, beautifully done, Zella - hugs to you! Your card is so meaningful and I love the sentiment that your paired with your digi! Your card is so pretty with the heart-shaped world map! Very nice! Love this image and verse, wonderful card for so many different things. Hi Zella! You have done an amazing job on this card. I always enjoy scripture cards more than any others, and would of course LOVE to have you share it at Word Art Wednesday. I'm having so much fun on this blog hop. Everyone is SO talented. What a great set to use for this hop! I love everything about it. Beautifully done! Delightful card!! Love the heart shaped world and the Scripture you've used is perfect! Gorgeous layout and design!! I love it! I love this image and you did such a great job with it! Perfect for so many occasions! How talented you r to work this digi into a Valentine card. I love it. Thank you for show us ur talent. I wish you and your loved ones a happy New Year.may 2014 be a year filled with lots of amazing memories.health & happiness to you and your loved ones. thanks for sharing your gorgeous creations with us.You did an EXCELLENT job whit this image,the card is adorable ,love it.I wish you many more creative years of inspiration! !Keep up the fabulous work. Lovely card -- but most importantly is the message it sends! This card is wonderful! I love the hear-shaped world and it goes perfectly with the scripture! My all time favorite verse, lovely card. Great going Zella! Will visit the links you've provided :). And, your card is so very beautiful with a beautiful scripture! Congratulations Zella! You're going to enjoy working with her digitals. What a beautiful card! Just wonderful!! I love that image too just as I "heart" the world! So pretty. You did it perfectly because the image really pops off the brown!! What a great message too! Beautiful. I love the way you used the sentiment to match the image. PERFECTION! Love the image Zella, especially paired with the scripture. Awesome card! This is so lovely, Zella! I really appreciate that you focused on the Lord's love for all of us in your card. The image really does pop against the warm neutrals of your background. Thank you for sharing this heartfelt card for our hop, and welcome again to the team. Hugs! Great card, and what perfect paper to use with that image and sentiment! Very nice layout. Thanks for sharing! Beautiful quote on your awesome card. Thanks for your sweet comment too. Have a fun and crafty week. Love this card, Zella! Great job!